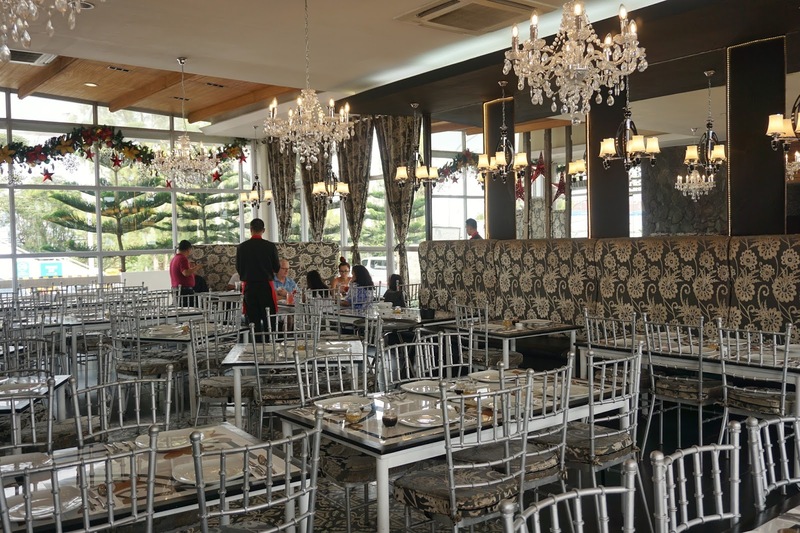 I usually visit Tagaytay for a quick getaway whenever there's a short holiday. And two weeks ago, I decided to spend a day there to take a break from the insane city life. But instead of unwinding at our favorite resort, R and I decided to do something different and visit Sky Ranch. 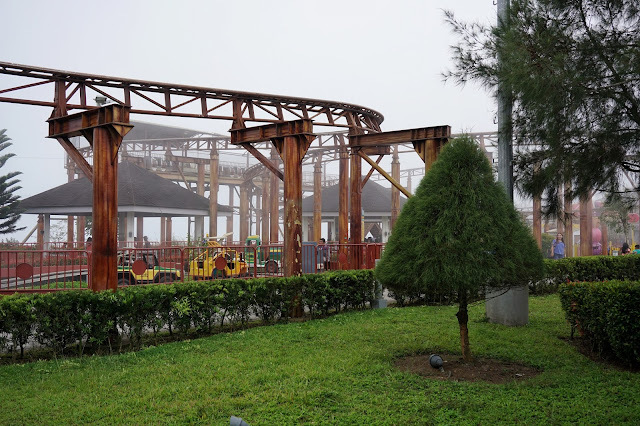 This amusement park developed by SM group has been around for a couple of years now and has been a destination of choice of local travelers. 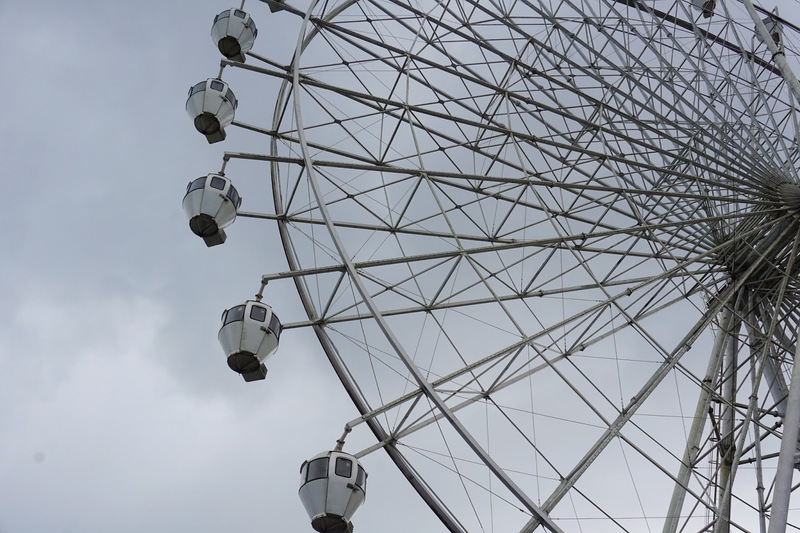 It is easy to spot the place with its ginormous Sky Eye ferris wheel. My eyes twinkled with delight upon seeing several restaurants surrounding the park. And I saw a few more inside. 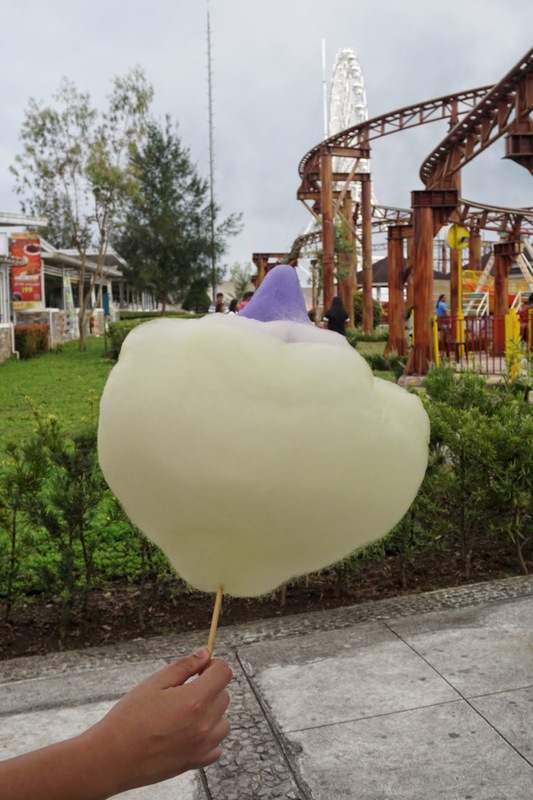 I figured that it might be best to go on a food trip first before going crazy with the different rides available. I spotted a takoyaki stand and got two sets of four pieces for PHP35 per order. 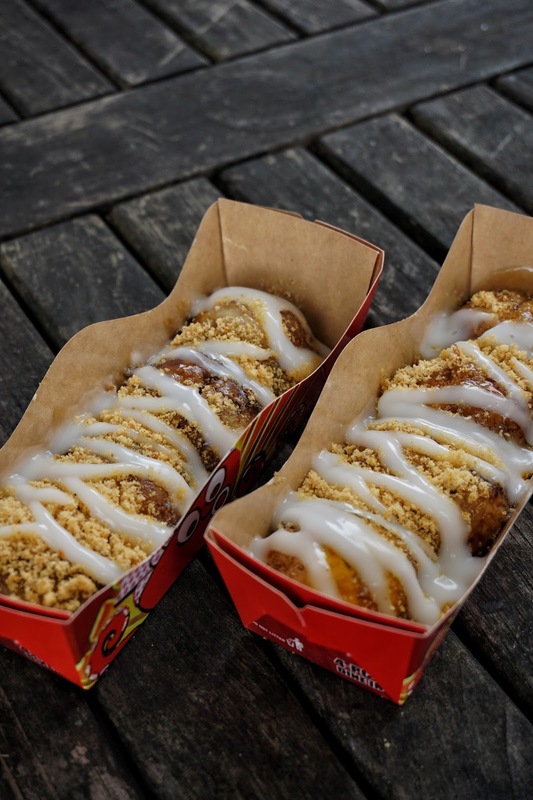 I tried sweet and spicy just to compare and I was so glad I did. The spicy variant was too spicy for my liking but the sweet version was good. 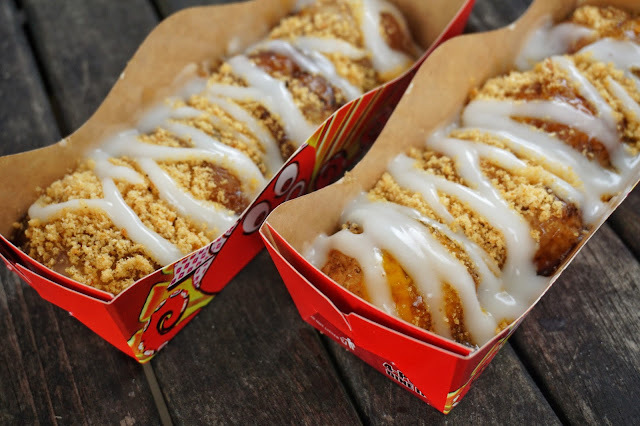 Make sure to slice the takoyaki open to avoid getting your tongue burnt as they serve these yummy tako balls fresh. It could also be messy to eat so walk slowly or pause when you take a bite. 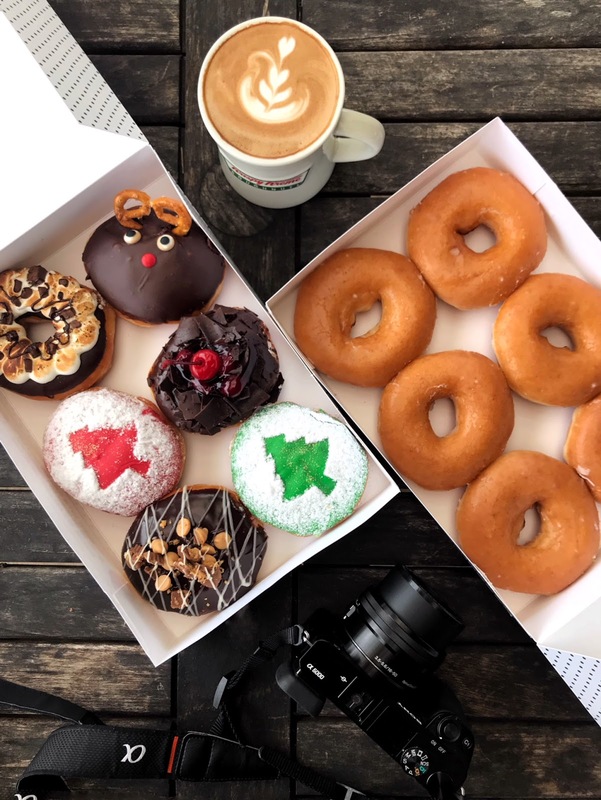 If you are looking for something festive and sweet at the same time, one of the best places to satisfy your cravings would be Krispy Kreme. 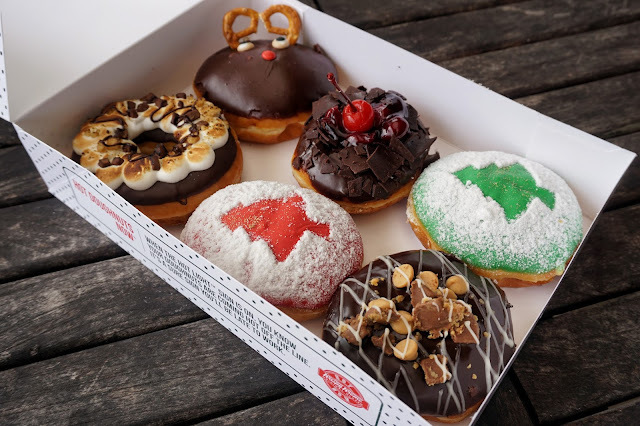 If you drop by this month, you could also try its holiday-themed doughnuts. 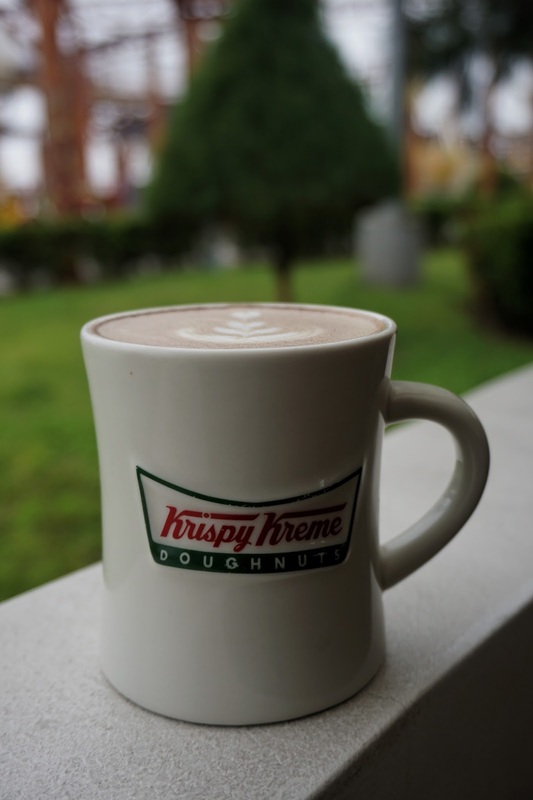 But if you're more of a classic foodie like me, Krispy Kreme also has its signature Glazed doughnuts. After indulging in some sweets, I decided to take a break from sugar and headed to Jose, a Filipino restaurant just a few steps away from Krispy Kreme. 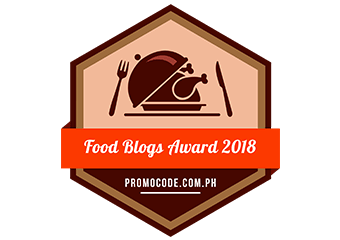 I was spoiled by its Prime Cut Tuna Kinilaw (PHP245), Sizzling Chili Garlic Crispy Pata (PHP495) and Sizzling Mixed Seafood Curry (PHP385). 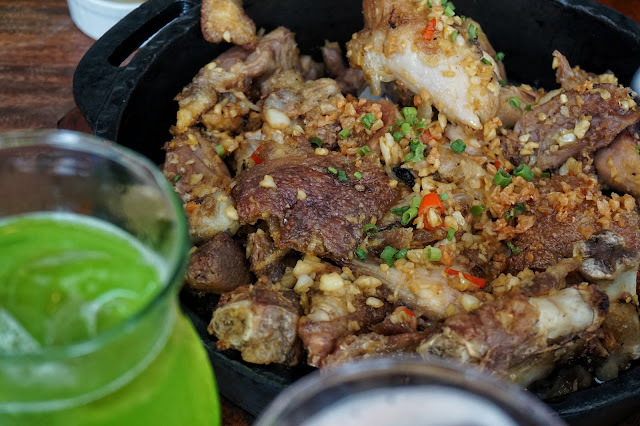 The Crispy Pata was bang for the buck. 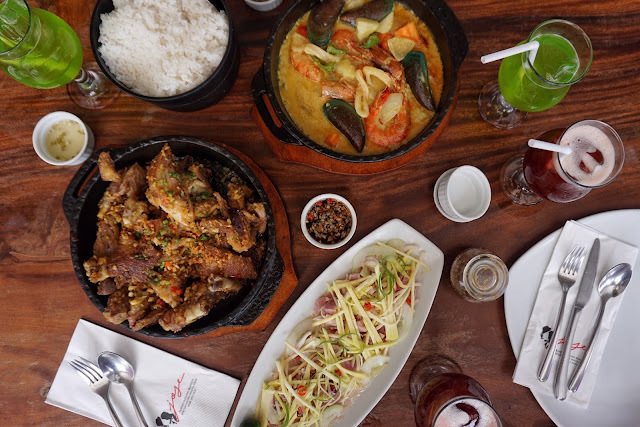 One order is good for 4 to 5 persons, perfect for the family. I enjoyed every bit of the crunchy skin and juicy pork meat that I had to have R stop me from eating more as I wanted to check out a few more stores before maximizing our ride all you can pass. 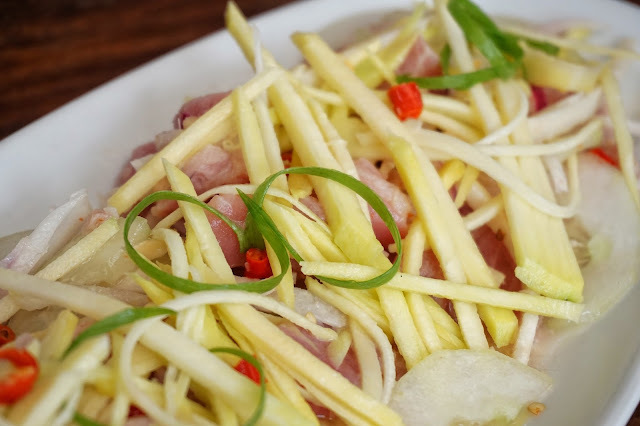 If you're fond of tangy dishes, then you'd enjoy tuna kinilaw. But if you like a different kind of flavor and spice is more of your preference, you'll definitely enjoy the mixed seafood curry. 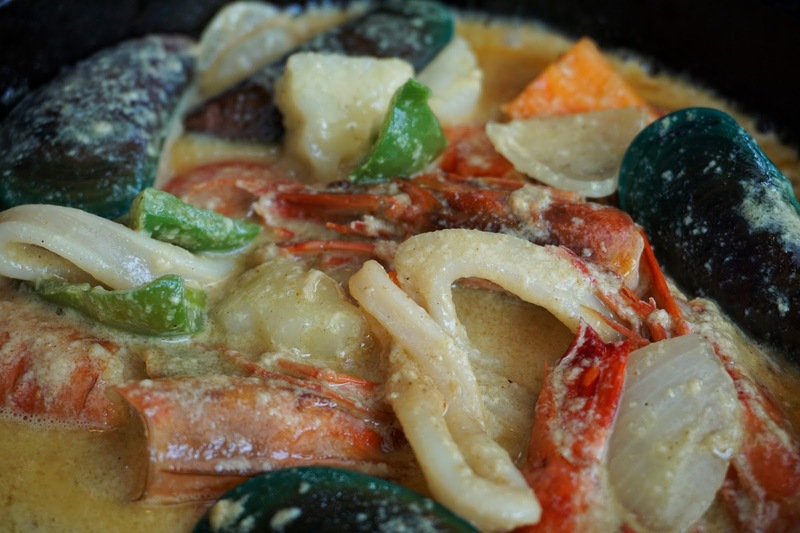 The sizzling skillet of shrimps, mussels and squid in coconut crem and curry is best paired with rice. As I take my last few bites, I craved for something sweet again and decided to look for cotton candy. Luckily, Sky Ranch has one near the roller coasters. 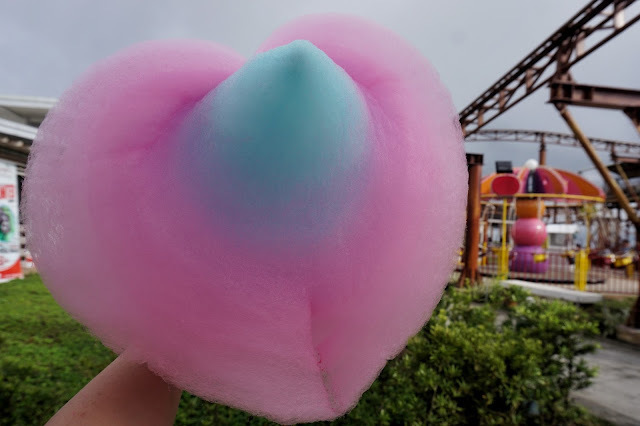 Unlike other cotton candy stores where you can only choose one color, here at Sky Ranch, you can choose up to three flavors (PHP50, one flavor | PHP60, two flavors | PHP70, three flavors) and have it shaped as heart or flower. 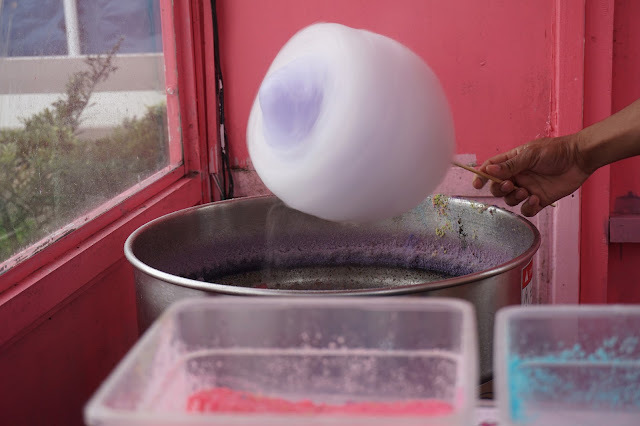 We tried all flavors and realized that the best flavors are still strawberry and bubblegum. We got very thirsty halfway through our fluffy treats. 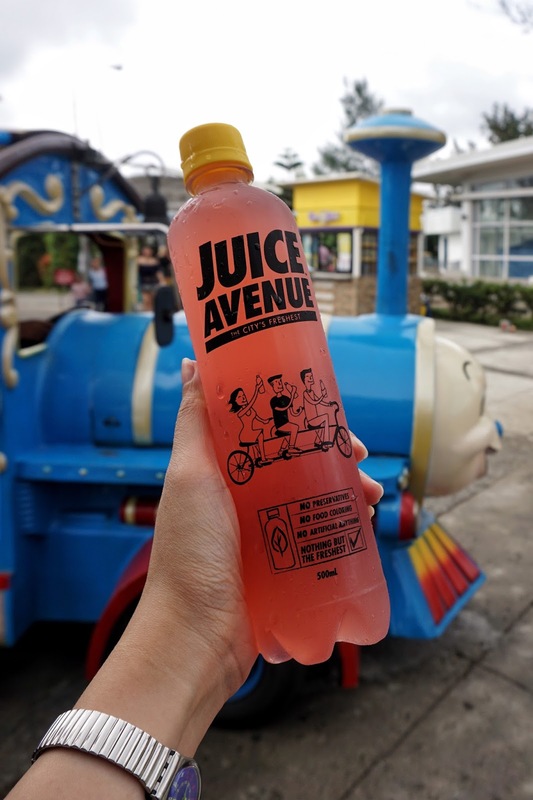 Thankfully, Juice Avenue is just across the cotton candy stand. I got a bottle of Watermelon Juice (PHP59) while R tried Calle Escolta (PHP65, 12 oz. | PHP85, 16 oz. | PHP99, 22 oz.). I requested to skip the milk from R's smoothie so that I could enjoy it too. And I liked it! The blend of mango, watermelon, banana and melon was great though the taste of banana slightly overpowered the rest. But if you want something that will quench your thirst, I highly recommend getting the watermelon juice. 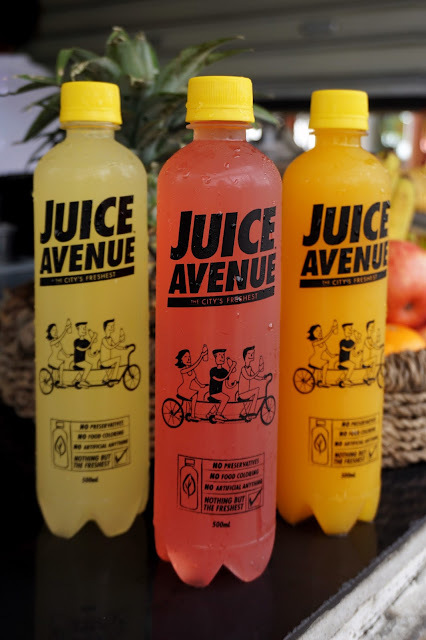 Its light sweet flavor was perfect to keep you cool and hydrated. There are several other restaurants that caught my attention. But I'll leave those for next time to give me another reason to go back. After half an hour of walking around and waiting for the drizzle to stop, we started to enjoy some rides. Our first one was popular Sky Eye (PHP150/ride). We had to wait about 15 minutes in queue before we got to ride which took about 5 minutes. 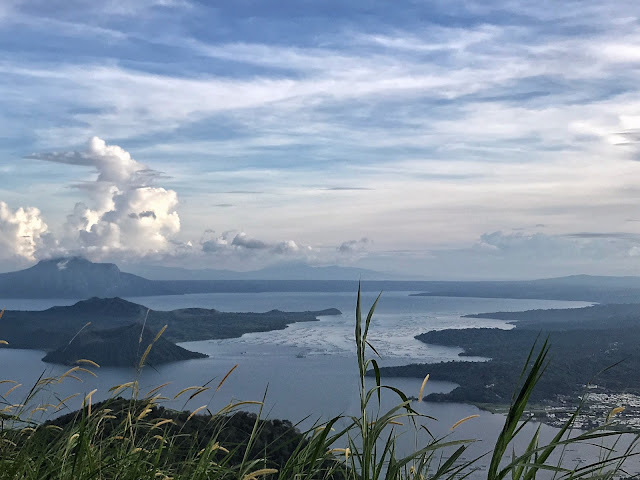 Those who are scared of heights would not enjoy the slight shaking while the cart turns around but it gives a beautiful view of Taal Lake. We then tried Drop Tower (PHP100/ride) which took me a while to give in to riding. I absolutely hate rides that suddenly drops and make me feel like I displaced my tummy (and heart) but I hate being called lame even more. Surprisingly, it was not as scary as I thought. 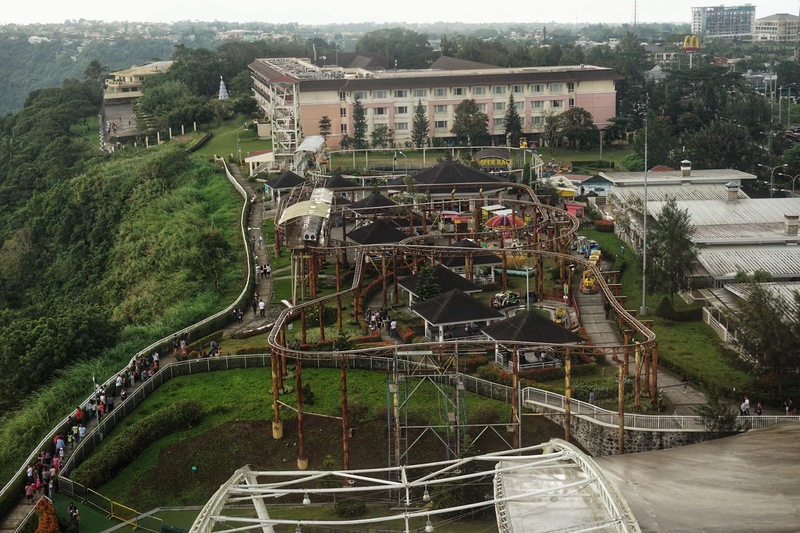 But the ride that made my knees weak was Super Viking (PHP100/ride). At its maximum swing, you'd feel like you're no longer sitting but standing as you try to stay still. The ride felt really long which made it even scarier. But you'd definitely get your money's worth if you are an adrenaline junkie. We rode almost all the rides in the park (rates ranges from PHP50 to PHP150) but if I were to choose just one, I'd stick with Sky Eye. Despite the sudden drizzles every hour, R and I had a blast spending the afternoon at Sky Ranch. I'd definitely visit again to try the other restaurants. Note: Entrance fee to the park is PHP80 on weekdays and PHP100 on weekends (kids 3 feet and below get in for free). Tickets to rides ranges from PHP50 to PHP150 while activities like zipline costs PHP500. 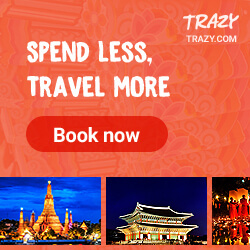 I recommend you to get the unlimited rides deal via MetroDeal instead as it will definitely save you a lot if you like to try all the rides. 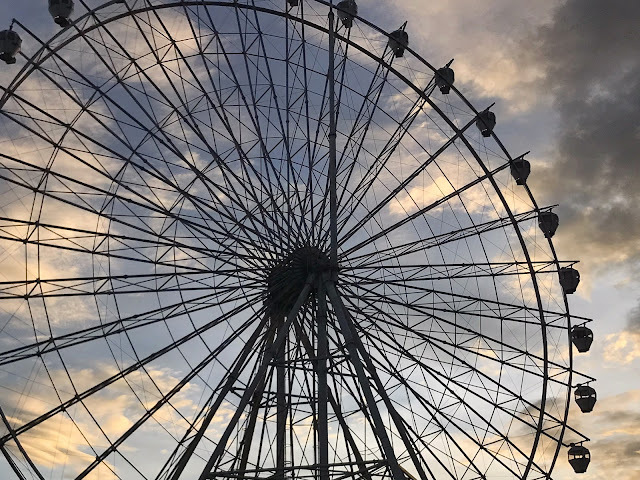 Sky Ranch is located at Tagaytay-Nasugbu via Tuy Road, Barangay Kaybagal South, Tagaytay City (beside Taal Vista Hotel). It is open from 10 a.m. to 10 p.m. on weekdays and 8 a.m. to 10 p.m. on weekends. and holidays.